All images are the copyright of Roy Engelbrecht. All Rights reserved. I don’t usually write sad stories to my posts, however today I make an exception. In 2000 Linda and I went to the Humane Society to look for a new house cat. As we walked by the cages, This black cat stuck his paw out to us as if to say “here I am, I’m the one you came for” We loved him right away and adopted him. He was a healthy 16-18 pound cat with a terrific personality. 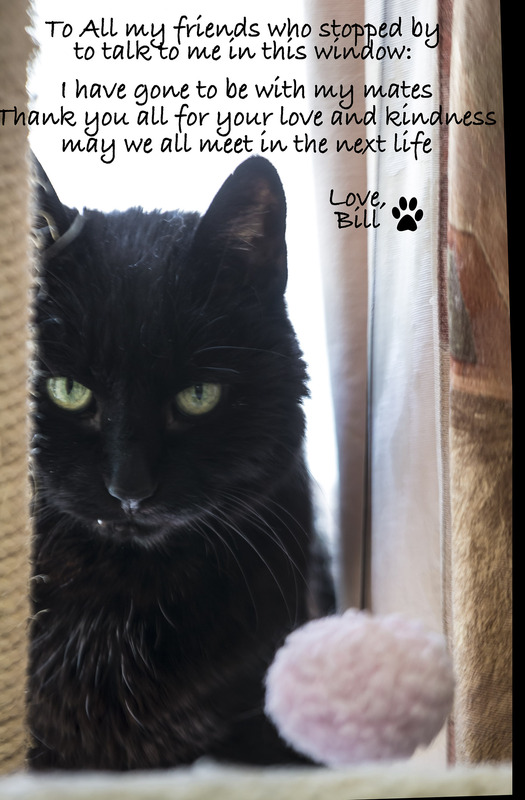 When we found a female newborn kitten in our garage, even tough Bill was a male, he”mothered” the newborn until she was on her own. Every morning we would take the cats with us to the studio, and at night bring them back home…there’s no point in having a pet if you dessert them all day while you’re at work. Bill would sit in the window of our studio everyday looking at all the passers by. He made a number of friends who would always stop by to talk to him, and he’d alway return the conversation. What a wonderful cat and friend. Today we lost Bill. To those of you who have pets you’ll understand our sorrow. How would we cater for the view review spectrum of learners. Though I met him only briefly, Bill will definitely be missed by your web designer!